HomeNewsTackleHow to replace rod guides? How to replace rod guides? 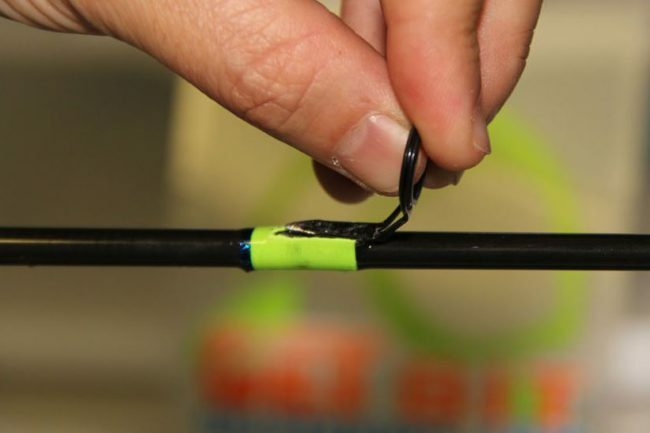 Broken rod guides are very common for any hard-fishing angler. 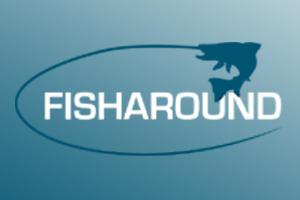 However, you can fix your favourite fishing rods quickly and inexpensively. 1. Warm up the broken tip just enough to release the epoxy glue. 2. 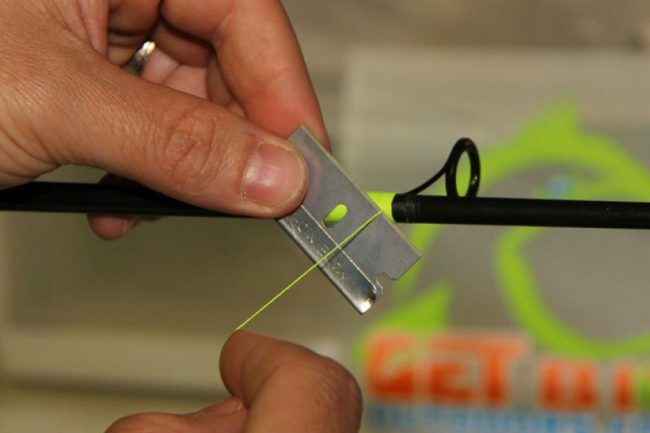 Use a razor blade and soft sandpaper to remove the old epoxy from the rod blank. 3. Apply new epoxy to the clean tip. 4. Slide on the replacement tip. 5. Make sure it is straight and peel off the excess epoxy before it hardens. 6. 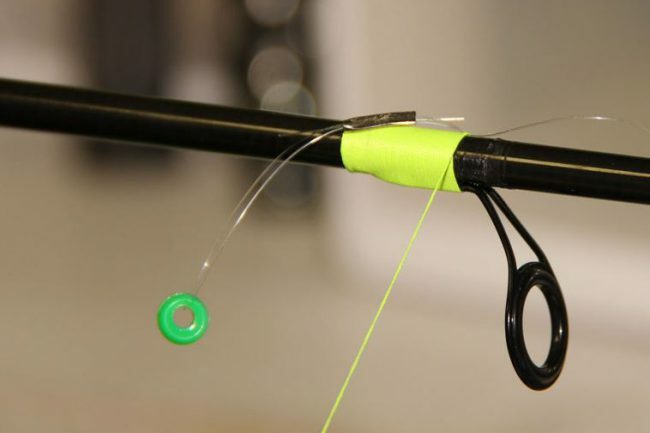 How to re-wrap a rod guide? 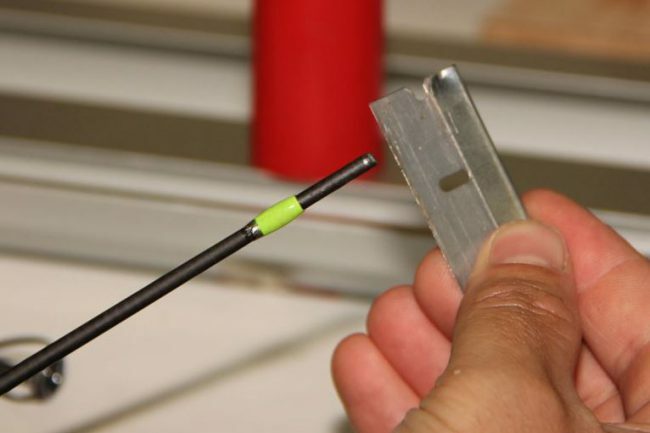 - Start by softening the epoxy carefully with a bit of heat to make the thread easier to cut and remove. 8. Remove the guide carefully. 9. Position the new guide on the blank using some tape. 11. 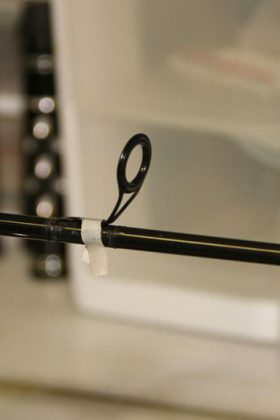 Rotate the rod until the thread wraps over itself tightly. 12. Remove the tape and cut the tag end close to where it exits the tight wraps. 13. 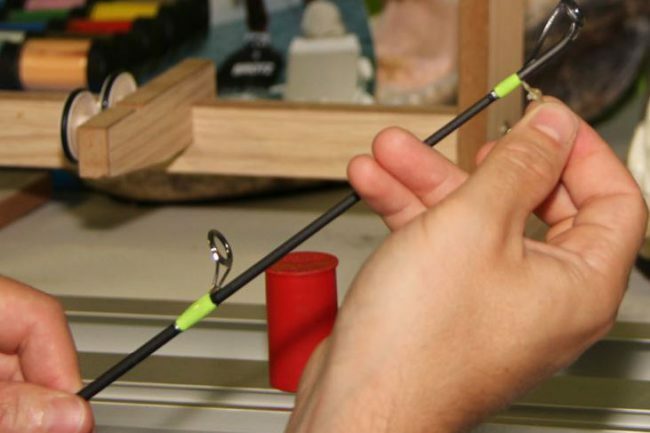 Rotate the rod and continue to add close wraps. 14. A loop of mono or thread is needed to complete the wrap. 15. Wrap the last 6 to 7 turns of thread tightly over the quick-pull loop. 16. Insert the tag end and pull it out. 17. Cut your tag end. 18. For adding a second colour of trim thread, repeat the entire wrapping process, working in the opposite direction. 19. 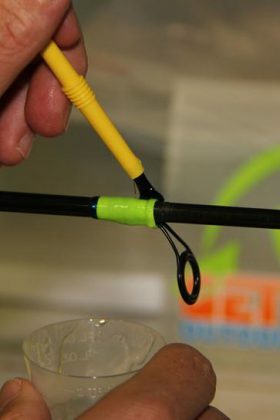 Use a small paintbrush to apply epoxy to your wraps as you slowly rotate the rod. 20. 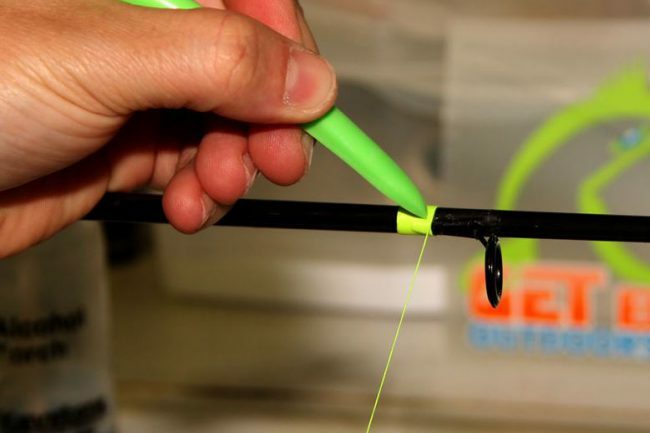 Be sure to apply epoxy all around and behind the guide foot, which will keep water out. 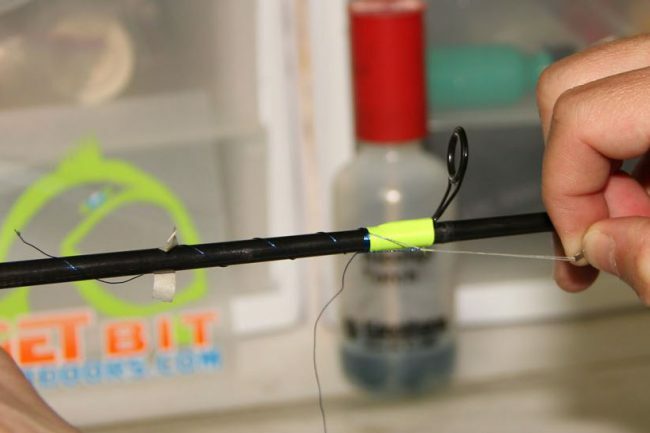 Kevin Brotz of Get Bit Outdoors offers step-by-step instructions that describe how to replace a rod tip and how to replace or rewrap a guide on your fishing rod. 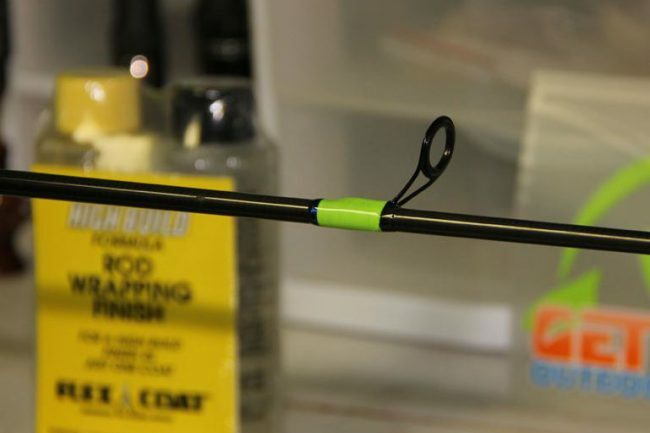 In order to replace a rod fin, you have to follow few easy steps. First of all, you need to remove the damaged rod tip. 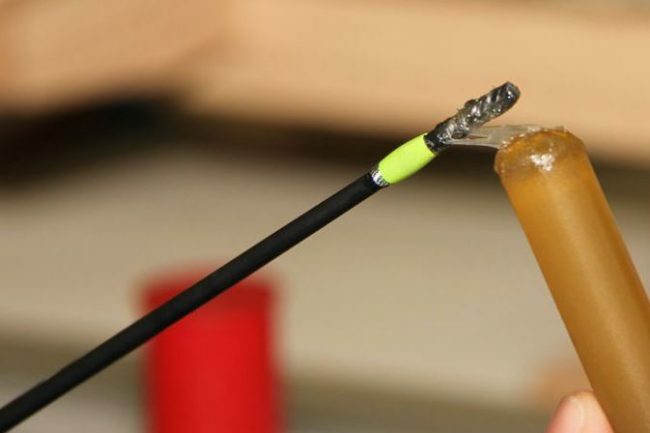 Start by warming up the broken tip just enough to release the epoxy glue. You should be applying small amounts of heat to gently remove the rod tip. 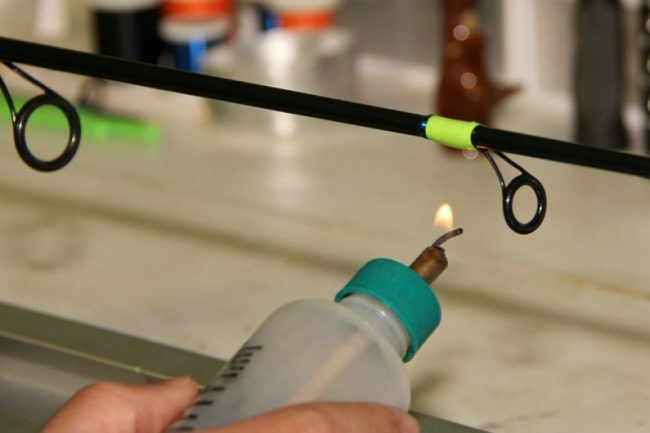 While warming up the glue, be careful with it as too much heat can damage a rod blank. You can use a regular lighter, as well as alcohol burners (they don't produce soot and burn clean). 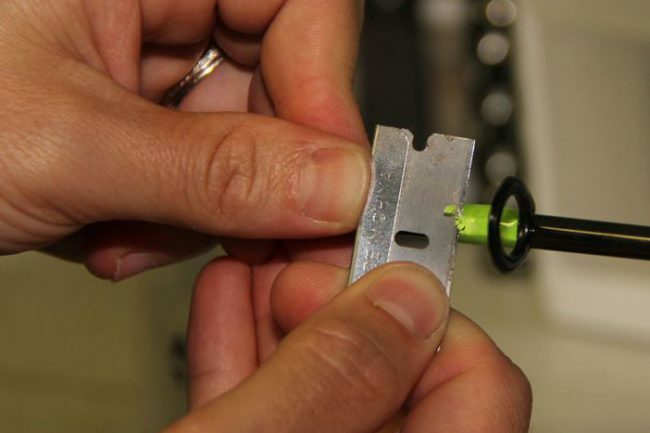 Once you remove the rod tip, use a razor blade and soft sandpaper to remove the old epoxy from the rod blank. 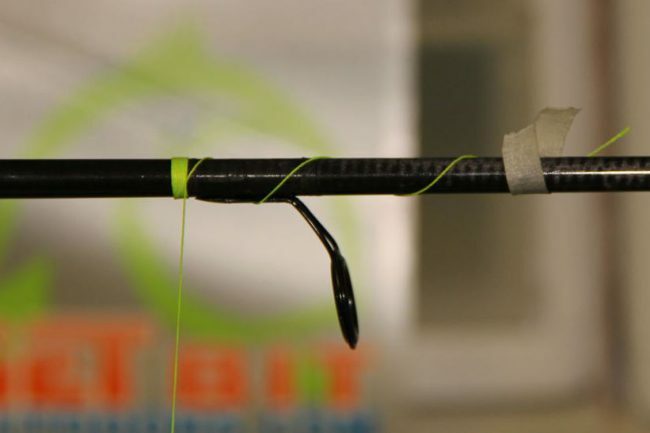 Then you apply new epoxy to the clean tip and slide on the replacement tip that matches the size of your rod blank, ensure it is straight and peel off the excess epoxy before it hardens. If the tip is not straight with the rest of the guides, reheat it and rotate it. Start by softening the epoxy carefully with a bit of heat to make the thread easier to cut and remove. 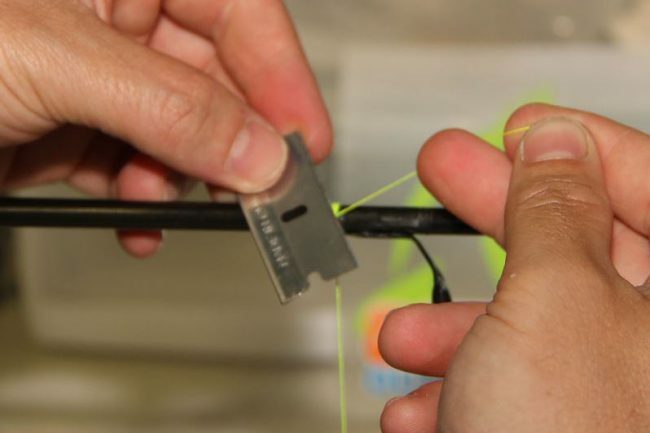 Use the same process with a razor blade to remove the rest of the thread and use alcohol to clean the rod blank. 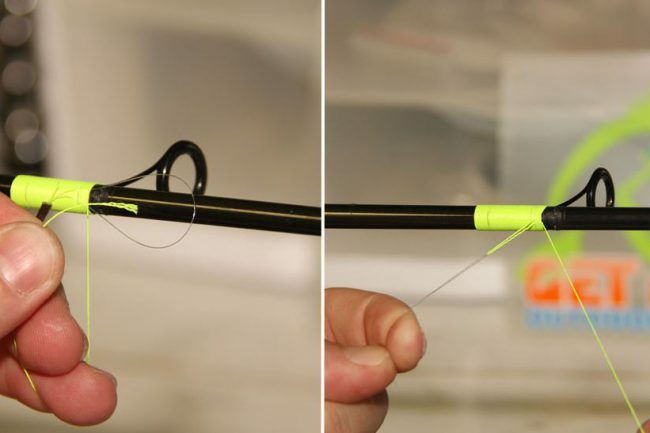 Once it is properly cleaned, you can start the process of rewrapping the new rod guide. Position the new guide on the blank using some tape or guide-foot adhesive. You will be able to fine-tune the position of the guide after you start wrapping it. thread slowly back until it is a quarter-inch past the guide foot. 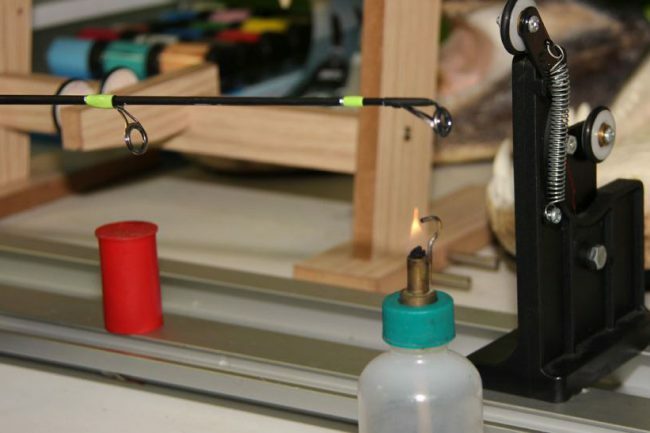 Rotate the rod until the thread wraps over itself tightly. This is critical as it eliminates the need for any knots. Rotate and add at least five more wraps close together, working back towards the guide. Remove the tape and cut the tag end close to where it exits the tight wraps. 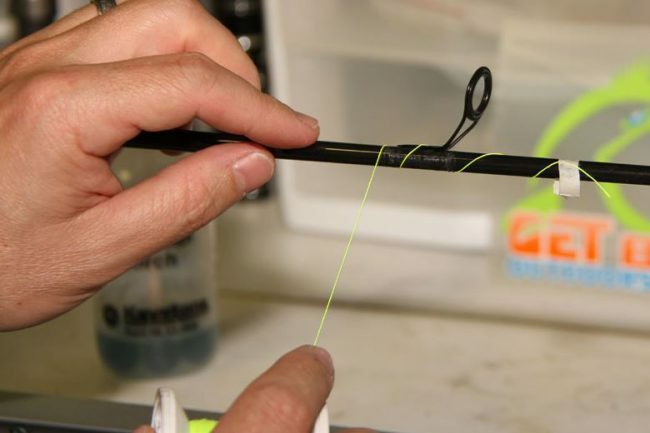 Rotate the rod and continue to add close wraps. Use a thread burnishing tool to keep the wraps tight against each other but not overlapping. 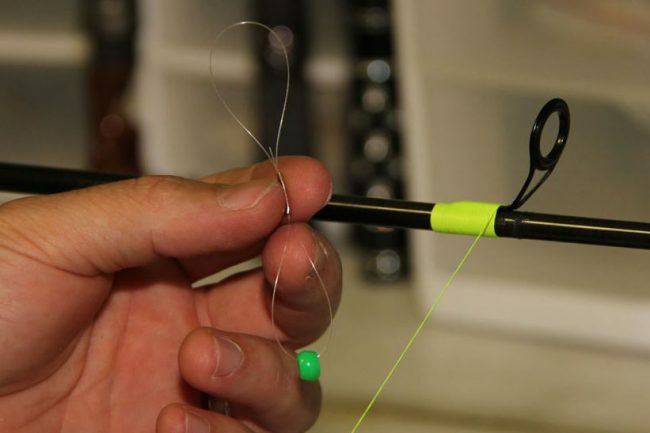 When you are about six turns from the leg of the guide, you will need a loop of mono or thread to complete the wrap. This homemade tool called a quick-pull works great. Wrap the last 6 to 7 turns of thread tightly over the quick-pull loop. Cut your thread, leaving a long tag end to work with. Insert the tag end of your thread through the loop of the quick-pull (left). Gently pull the quick-pull out, bringing the tag end of your thread under the last few turns you made (right). This will secure the thread in place. Carefully cut your tag end neatly against the thread wraps. Use the burnishing tool again to clean up your wraps a final time. If you are adding a second colour of trim thread, repeat the entire wrapping process, working in the opposite direction. 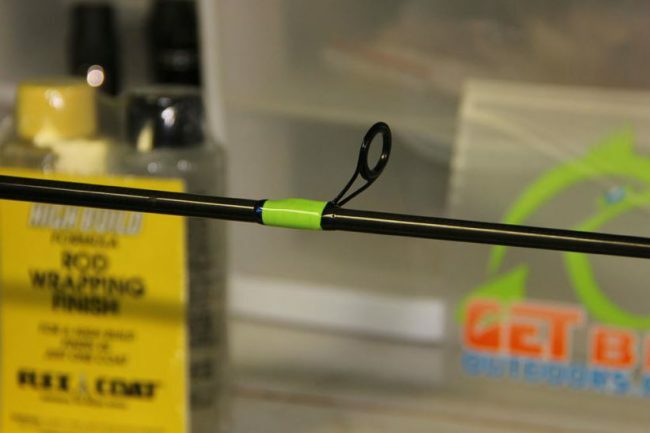 Use rod-wrapping finish epoxy with a small paintbrush to apply epoxy to your wraps as you slowly rotate the rod. The epoxy should be applied onto the wraps as the rod rotates, rather than brushed on. 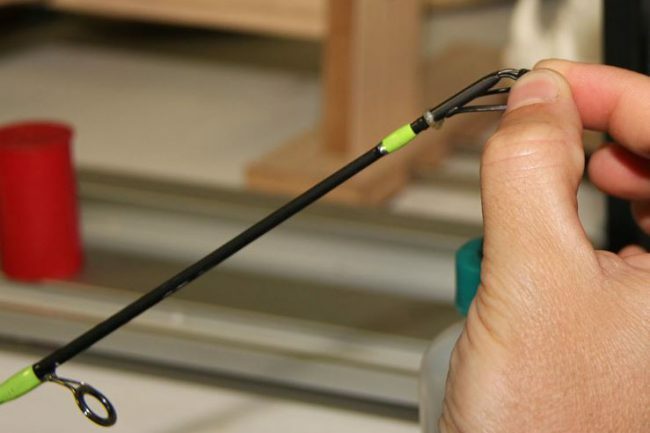 Be sure to apply epoxy all around and behind the guide foot, which will keep water out. For more useful tips see the Get Bit Outdoors Youtube video.